Patrick Horgan celebrating Glen Rovers county final victory. FOR PATRICK HORGAN, 2016 has been a campaign of hurling contrasts. With Cork the season was one of difficulty. They narrowly avoided plummeting down in the league, were soundly beaten in their Munster opener by Tipperary and the year was drawn to a halt in July as Wexford ended a 60-year wait for a championship breakthrough against Cork. After that gloom, life with the club has provided rays of brightness. In October Glen Rovers retained their Cork title – a crown that eluded them since 1989 before last year – and next Sunday in Semple Stadium they have a glorious chance to climb to the peak of Munster club hurling for the first time in four decades. Horgan has spearheaded the Glen’s winning run, providing exactly what a club seeks from their marquee county forward. He shot 0-12 (eight from placed balls) in the Cork decider and then 0-8 (six frees) in the Munster semi-final a fortnight ago. His last quarter scoring sprees were hugely significant in both cases, 0-5 on the bounce in the last ten minutes against Erins Own and nailing three late frees against Patrickswell. 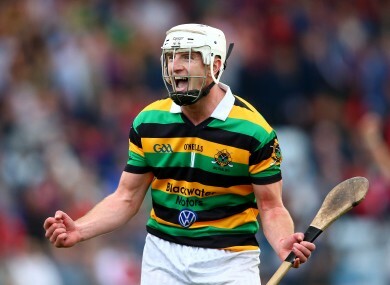 What a performance by @Hoggie088 in the last 10mins to see Glen Rovers over the line! Class act! The club hurling environment is one he is thriving in and enjoying. “I think with the club it’s just really relaxed and you go out and play hurling the way you always were taught. “(It’s) not ‘oh you have to be standing here now for this’ or you have to do something else like a robot, it’s just go out and play whatever we want. If that’s good enough it’s good enough, if it’s not, it’s not. The philosophy is at odds with a defensive strategy Cork tried to employ this year, utilising a sweeper against Tipperary could not prevent the scoring damage that the Premier attack inflicted. “As everyone would probably know that’s probably not the way Cork play,” admits Horgan. The current wave of negativity engulfing Cork hurling is difficult to ignore. “Cork are coming in for a lot of criticism, I don’t know is it right or wrong,” says Horgan. “Last year we had a bad year now I know with Cork, but before that we played in All-Ireland finals, two Munster finals, two League finals, that’s all im the space of four years. “I think we beat Tipp when we played minor (in 2006) by 11 points in the Munster final, and then I think Galway beat us, I don’t know how they beat us on the day. “Eventually Tipp went on to hammer Galway in the final. It’s just a bit unlucky. I think we played Galway in a few under-21 semi-finals in Thurles as well, just point wins, which turned out to be huge. It’s only three years since Horgan was seconds away from being crowned Cork’s All-Ireland final match-winner before Domhnall O’Donovan’s surge upfield pulled Clare back from the brink. “You try not to think about it because you depress yourself,” says Horgan. “You train all your life to be in situations like that, and for us we were winning the match when the time was up. Unbelievable score from them. “At the same time, then games were unbelievable to even watch. To play in they were crazy as well and I think hurling is actually a small bit after changing since then. Glen Rovers are concentrating on their own progress. That win over Patrickswell was the first victory by a Cork club on the Munster senior hurling stage since 2009. Defeating Ballyea on Sunday may be a boost for Cork hurling but it would be a bigger milestone in Blackpool. “I think a lot of people were happy for us to get the win but I think if we win Munster it would be a huge thing in Cork. “We won’t see it that way in the Glen, we’ll just win because we want to bring a cup home next Sunday. We won’t have Cork in the back of our mind, we’ll just want to be doing it for ourselves. “It’s huge for us, having been there (last) 40 years ago. Last year when we won the county it was 26 years and celebrations went a small bit over the top. Email “Patrick Horgan - a year with Cork setbacks and hurling brilliance with the Glen”. Feedback on “Patrick Horgan - a year with Cork setbacks and hurling brilliance with the Glen”.